Kards is a high quality WWII based collectible card combat game with innovative frontline mechanics and gorgeous hand painted card art. Previously featured on Alpha Beta Gamer during the closed Beta sign up, Kards is a tactical CCG that sees players facing off in 1v1 battles using authentic vehicles, aircraft and infantry from the Second World War. 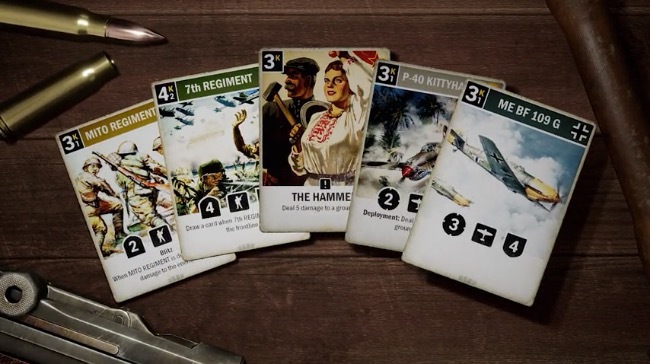 There are five different factions to choose from (Britain, Germany, Japan, The Soviet Union and the United States), each of which have their own unique customizable decks that cater to different warfare strategies. If you’ve never played a CCG before then there is quite a lot to take in, but if you’ve ever played Hearthstone then most of the gameplay mechanics will be reasonable easy to pick up. The biggest difference in Kards is the frontline system, which sees players fighting for control of the no man’s land in the center of the battlefield. Only one player can hold the frontline at a time and most units need to be in the frontline to be able to attack the enemy base or any units in the deployment area. As in war, holding the frontline can be tough though so you need to be strategic about when you make a push forward. Kards does a great job of delivering a fun, fresh take on the CCG genre with the frontline mechanics adding an extra layer of depth and the WWII backdrop making a nice change from the traditional high fantasy setting. The quality of the Roy Cross-esque artwork that’s been put into each individual card is another highlight and almost makes it a shame to see them being blown up! Highly recommended.